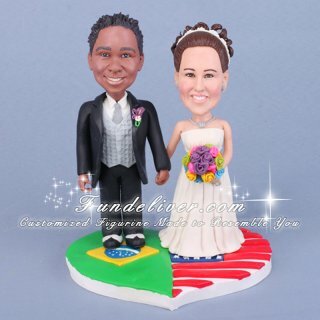 This is a completely customized ethnic cake topper ordered by one of our customers. They would like a classical wedding cake topper with the classic pose- bride and groom figurines holding hands with a bouquet in towards bride and smiling. Her flowers are fluorescent green, yellow, pink, blue and royal purple (regency from David’s Bridal). The bouquet is rounded. Groom is in a black tux, white shirt and the purple calla lilies on his lapel (see above picture), platinum vest, tie and ascot, black and white shoes. Her dress is “soft ivory” and a tiara on her head. The heart base is the most funny part and also that is why we call it ethnic wedding cake topper. They would like to have half the heart painted with the Brazilian flag and the other half the American flag. That way they can incorporate their two nationalities. Groom is standing on the Brazilian side and bride on the American. 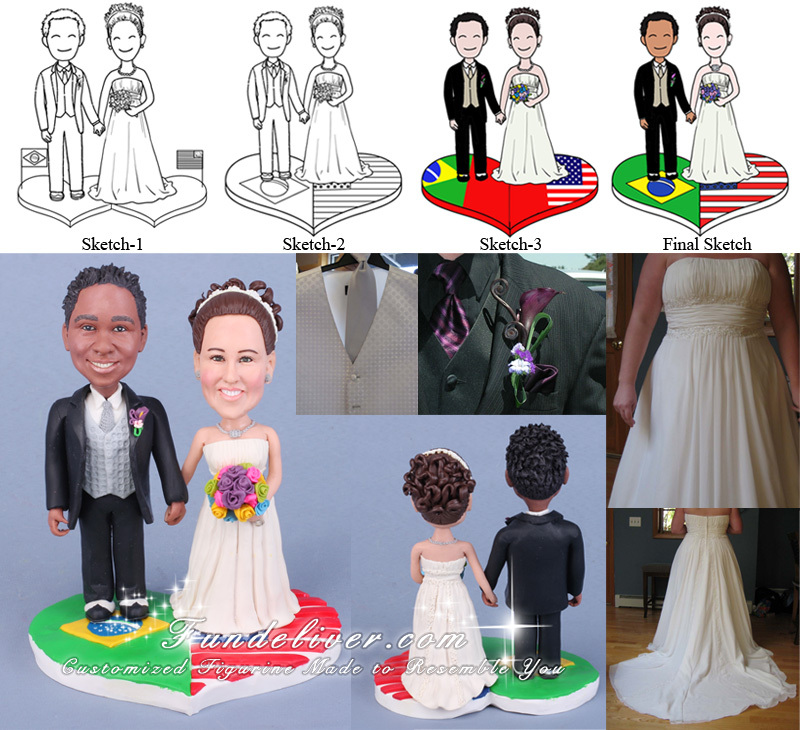 If your couples are from different nations and races, what is your idea about your ethnic cake toppers?